A few weeks ago we had the privilege of hosting the Princess Royal and her husband Vice Admiral, Sir Timothy Laurence. 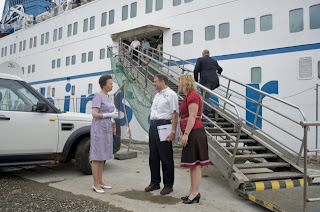 They were touring Sierra Leone for a few days as part of the 50th anniversary of independance and a chance to visit some of charities that Princess Anne was patron of. They were onboard for just over 1.5 hours and talked to anybody they could. Their intention was to meet people in their daily "work" lives. Before the visit, Sharon tried to prepare Nathanael, going through all the be good, be polite, answer questions if the princess asks you something etc etc talk. Nathanael's response was "ok, I will try mummy, (and with a big cheesy grin) but you never know what might happen". We don't know whether that was a disclaimer incase his body did something he had no control over or what, but it didn't exactly put us at ease. Hence I think the photo below is probably one of those moments when his body did something he had no control over! Weddings are always exciting but even more exciting when you get to experience it in a different culture. Long time friend, Alfred, who has worked in the deck department both on the Anastasis and the Africa Mercy was getting married to Edwina from Sierra Leone who was working on board as a day worker with us. Here you have to do a lot of planning because just going to do a single task can take all day to travel there and back to complete a task. Events started on the Thursday night where we were invited to the "formal" part of the marriage. We filled 3 landrovers and drove to the family house of Edwina. Initially we weren't allowed to enter the building so the upstairs landlord gave us shelter from the sun rays. Meanwhile, Alfred left to "hide". Now you're probably thinking what is going on, well, yes, so did we, but this is Africa and we went with the flow. After all the relevant people had arrived the ceremony began. I say arrived, because again, this is Africa and so you just wait until everybody is ready. If somebody is on the other side of town, you know you're going to be waiting at least another hour. It's just normal here, time is a guide not really a definate. First came a knock at the door. The host asked who was there and the response was "visitors". "Are you good or bad visitors?"....... "good visitors".....and so we went through this sort of drama/comedy play for a bit which had us in stitches with their quick quips. (Click play to see the video's). Fiinally they let the visitors in and after introductions they had a seat. The leader then brought greetings to prove that they were REALLY good visitors. He passed envelopes with greetings and money gifts for the father of the house, the sisters, aunts, brothers, landlord, village chief....you name it, it was in there. May I add, there was still no Alfred at this time! Then the real question came. The visitors had really come for a flower. Now the host met them with confusion because he was a pastor, not a gardener, he has no flowers. So they clarified it, a "special" flower. So they suggested that he must have a garderner in the house that looks after these special flowers. Eventually a lady came who acted as the gardener and so she shuffled away to look for that special flower. Finally she came with a little flower with a veil over her head. The visitor looked and decided that the flower was too young and he would come back for her in 5 years. The next flower was to skinny and tall and again didn't fit the special, perfect flower he was after. Finally they found the right flower and Edwina came in covered in a veil. More jokes followed and the visitors presented a calabash bowl and asked for her hand in marriage on behalf of the groom. They take the bowl away to examine the goods before accepting his offer. It seems the calabash was good because they accepted their offer. The bowl included a ring which was placed on Edwina's finger and a bible which she showed to everybody. Big cheers! Then it was food time. Each of us got given a plate of fish and chips which tasted wonderful. May I add.....still no Alfred. I was a bit concerned as it had been 2 hours he had been outside and he got to miss the good food too. Finally after the ceremony had finished, Alfred came in so we could congratulate them together. Normally they would now take the bride to the groom's house and they would live together as man and wife, but because this is a christian wedding they will wait until after the church ceremony a couple of days later. It was fun to be a part of this special occasion. So Saturday arrives and we all head up to the church in our nice african outfits to support Alfred and Edwina in the big day. The trouble with living here is that it's not worth spending too much time getting dolled up as you will be a sweaty mess by the time you get there. The service was about 2 1/2 hours and the church was full by the time it ended as people continued to arrive through out the ceremony. We enjoyed a good dance to "O Happy Day" whilst the register was being signed, 3 offerings for various things and different groups came and sang songs for the couple with plenty of African dancing. After the service we drove to the other side of town for the reception that was being held at the Mercy Ships team house that usually houses our off ships programs staff. The sun was shining with a light breeze in a lovely grassed area, ideal for a wedding party. The top table was set up on a platform along with the cake and the guests sat below. All in all it was great to be a part of a Sierra Leoneon wedding and something we wanted to share with you. Please pray for Alfred and Edwina as they begin their lives together as a married couple. Edwina will be joining us as crew so we will be getting to enjoy them for a while longer. Congratulations Alfred and Edwina and thank you for letting us enjoy your day (s). I love it when we are able to see former patients and see how God has changed their lives since having surgery on board a Mercy Ship. This is a follow up story on a Patrick, who's picture you've probably seen pictured on many Mercy Ships "before and after" pictures and leaflets. In the norm of a daily routine it's nice to know a difference is being made in the lives of many here. Patrick Coker hid in the house in his village for sixteen years. The huge tumor on his chin had made him the target of hateful abuse. 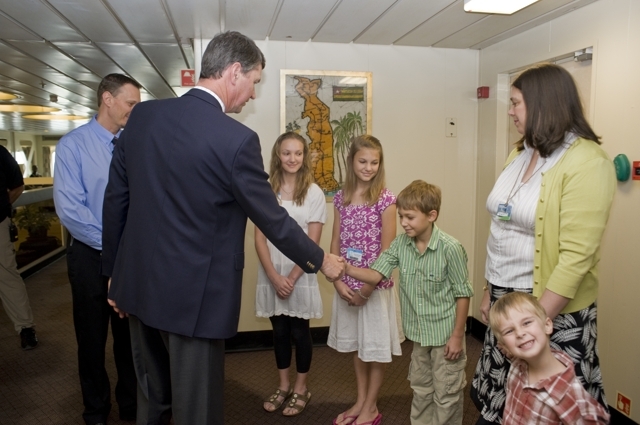 In 1992, his aunt gave him the exciting news that Mercy Ships volunteer surgeons could remove the tumor. Their hospital ship, the Anastasis, was docked in Freetown, Sierra Leone. But when he arrived, the field service was over. “Everything’s finished!” he was told. “If I don’t have the opportunity, I will go back to the province ready to die,” Patrick responded. He was given an appointment to be examined by Dr. Gary Parker, the Chief Medical Officer. “This is a minor job for Christ, but it’s a major job for me,” said Dr. Gary. Because the ship was ready to sail, Patrick was given the first surgical appointment in Senegal, the location of the next field service, and he was given money to cover the cost of his travel. But when the ship’s engines were started, it was discovered that the boiler was broken, thus delaying the ship’s departure. The replacement boiler was the wrong size, which meant there would be an additional wait for the right one. All of these problems worked for Patrick’s benefit. 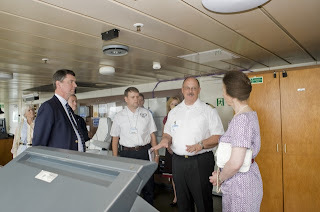 He had his surgery onboard the ship in Freetown. It took Dr. Gary nine hours to complete the surgery. Two weeks later, a second surgery replaced Patrick’s jaw with a titanium implant. Patrick also found a way to help other patients. After his recovery, he served as a translator for two field services on the Anastasis. Patrick had wanted to be a doctor long before his surgeries. But, as a youth, while studying a friend’s Bible, he dedicated his life to Christ. “The Lord called me to do His work,” he said. He became a teacher, instructing third-grade and fourth-grade students in math. During those years as a teacher, he met his future wife, Theresa, who sold snacks to the students during breaks. Today they are the parents of Mary, Emanuel, and John. After Patrick left his teaching position, he took training as a pastor and served as a part-time assistant pastor for many years. But he was recently ordained as a minister in his church. “God called me, finally, to be full-time in ministry,” he said with a gracious smile. “But there are a lot of people in the provinces who are not saved and don’t know about Jesus Christ.” For this reason, he was urged to be in a mission church also. Every month, he spends two weeks in each church, and he is training people in both churches to fill in when he is absent. Before his surgeries, he worked for survival. Now, his work is a labor of love. 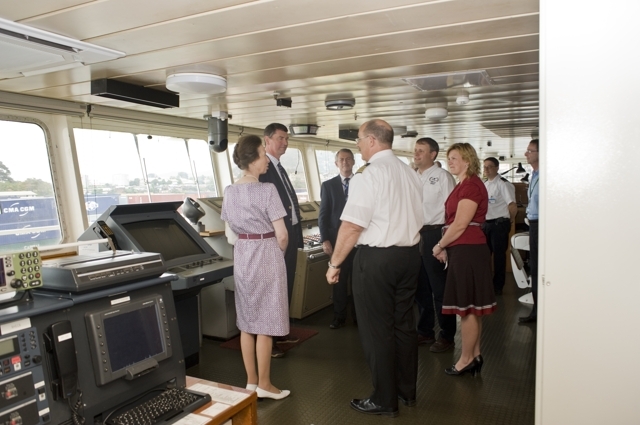 Now and then we get new crew members come that want to use their different skills to bless the crew on board. 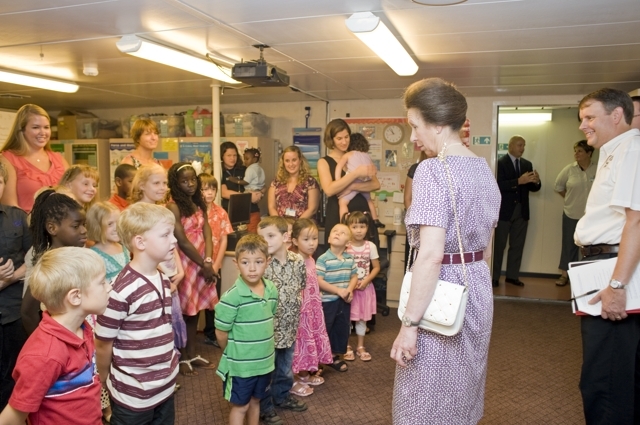 Recently Emma, who is working in the galley, offered the pre-schoolers swimming lessons. Back in the USA Emma is a certified swim instructor so of course we jumped at the chance for Nathanael to get some more swimming time in. Over a 2 week period the kids have been meeting for 6 half an hour sessions and they seemed to have had fun. Unfortunately our new pool can get a bit wavy when the ship is rocking slightly and the first two lessons were spent focusing on when the next big wave was coming. This is the result when it comes! At one point she had all the kids clinging on to her getting ready to ride the next wave! A calm moment to practice airplane rides whilst kicking their feet. Thank you so much for doing this Emma! Some of you who read this may groan at the idea of even thinking of planning for Christmas in the middle of October and it's just over the top, especially those who still have Thanksgiving to think of before that! Where as here in Africa, we start to panic as October approaches. We panic in case we didn't get that last gift for Nathanael on the last container that left Holland or the USA in September, or we're hastingly buying very "light" items to be sent in the mail and counting the cost of 55 cents an ounce for postal charges. 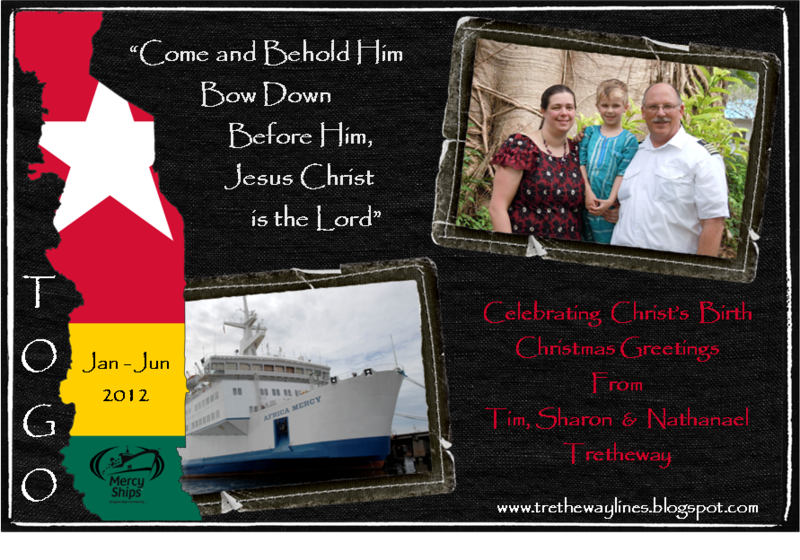 Spending Christmas in Ghana has made us even more creative. For us, Christmas preparations almost start at the beginning of the year. So now we are here, October has arrived and the top of the cupboard is full awaiting it's gift wrap. But amidst all the planning there is still one thing that is our focus and that is the celebration of the birth of our saviour. This year we came across the idea of the Jesse Tree. For some this might already be a tradition in their household but it was something we had never heard of before. "A shoot will spring forth from the stump of Jesse, and a branch out of his roots." It tells the story of God from the Old Testament to the advent season and the faithfulness of God across 4,000 years of history. The Branch is a biblical sign of newness out of discouragement, which became a way to talk about the expected messiah (for example, Jer 23:5). It is therefore an appropriate symbol of Jesus the Christ, who is the revelation of the grace and faithfulness of God. We were able to get hold of a book which will take us through that journey through the month of December with daily bible readings and devotions and also gives decoration ideas. So Nathanael and Sharon are now in the throws of making decorations to go along with it. There are many ideas that can be accessed online (see some links at the bottom of this post), whether it's templates, readings etc. Some churches even do an "ornament exchange" where 25 people make 1 of the decorations 25 times and then meet together to swap and get a complete 25 day set. These are our first ornaments in the making which include the sun to represent creation & light, Adam & Eve - sin, rainbow - Noah and the ark, coloured coat - Joseph, sheaf of wheat - Ruth &Boaz, Ladder - Jacob. There are still more being cut out and needing to be stuck together, but we'll share the rest with you when we're finished. About the Jesse Tree 2. On May 31, 1997, the Danish ferry Dronning Ingrid stopped running. A tunnel from the cities of Koersoer to Sproege made ferries obsolete. That was a very sad day for 11-year old Milan Falsing. “I cried for two or three days,” he said. Born and raised in the small town of Hoeng, Milan had traveled with his family by the ferry many times to visit family members in other parts of Denmark and especially to the small island of Aeroe, where his grandmother lived. “It was always a special occasion for me and my sister,” he recalled. 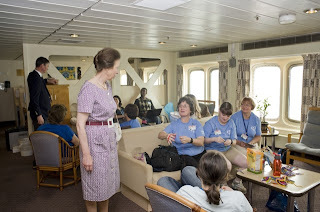 “On the starboard side forward (where the dining room is now) there was a play area for children.” Milan had so many happy memories of good times onboard the ferry, and he was broken- hearted to think there would be no more. His concerned mother contacted Scandlines, who owned the ferry at the time, and asked if Milan and his siblings could visit the ferry one last time to say farewell. The vice president granted the request. “When my mother gave me the good news, I was all jumpy and screamy and so happy,” he said. 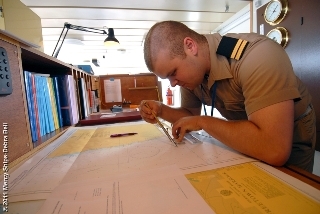 In the ninth grade, he began to prepare for his life at sea by choosing to go to a boarding school with a maritime focus. From there he went to the maritime high school, where he could get a high school diploma and a seaman’s degree that would allow him to find a position on a ship. 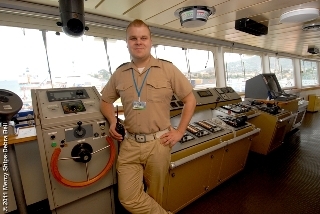 He went to work for the Maersk Line for his basic training at sea. They also had an educational opportunity for a duel degree, but he wanted to become a single navigator and chose the Marstal Maritime Academy, located on his grandmother’s island. “I have a big association with that island,” he said. 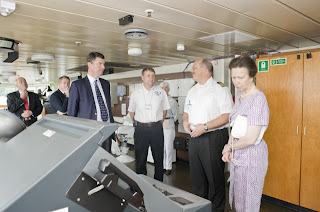 As a member of the Danish Ferry Institute, Milan kept his interest in the Dronning Ingrid alive. 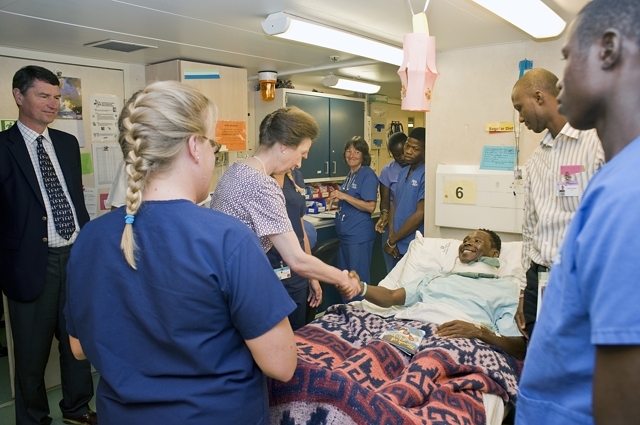 When Mercy Ships bought the ferry in 1999, it was moved to Newcastle, United Kingdom, to be renovated to become the hospital ship, the Africa Mercy. “I had never heard of Mercy Ships before and wondered what Mercy Ships was. What would a religious group want with a ferry? We didn’t know what God was doing with the Dronning Ingrid.” Milan’s interest was piqued as he followed the progress of the renovation. As soon as he received his Master’s Unlimited Degree, he started looking for an opportunity to serve onboard. His commercial job allows for lots of vacation time, but often it doesn’t coincide with an opening on the ship. When he realized his vacation finally coincided with an opening on the bridge this year, he applied right away. His application was accepted on a Monday, and everything was in order. But he needed his numbers for blood pressure and pulse. At midnight, he biked down to the emergency medical doctor, a short distance away, and explained what he needed and why. “It only took five minutes to get the numbers,” said Milan. 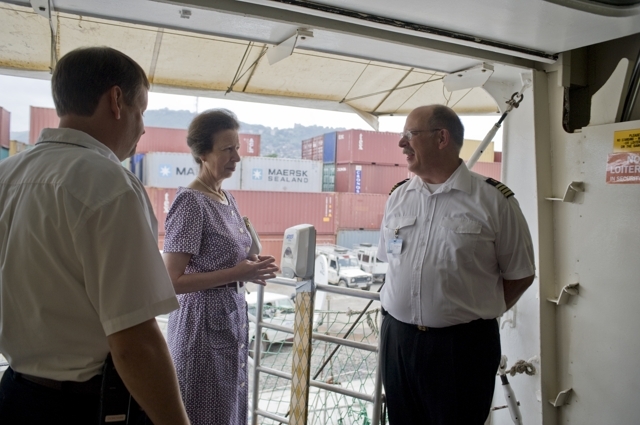 He called them in on Tuesday, and Thursday morning he left for Freetown – and became the first Danish officer to serve onboard since 2009. He confided that his mother and sister were elated that he was going to be on the ship and asked if there was room for them, too. Milan (his crew mates call him “Milo”) is very excited and happy to be serving onboard. “I don’t want to go home, but I have to,” he admitted. 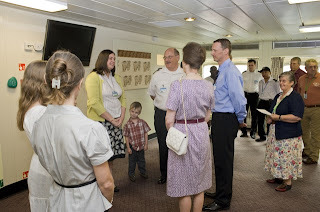 “I also would love to come back again.” He wants to promote Mercy Ships as much as he can when he goes home. “This is unique! You can’t find it anywhere in the world!” he exclaimed.